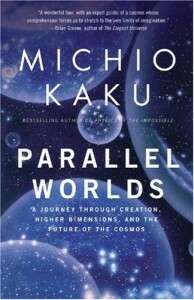 The Blurb:In this thrilling journey into the mysteries of our cosmos, best-selling author Michio Kaku takes us on a dizzying ride to explore black holes and time machines, multidimensional space, and most tantalizing of all, the possibility that parallel universes may exist alongside our own.Kaku skillfully guides us through the latest innovations in string theory and its latest iteration, M-theory, which posits that our universe may be just one in an endless multiverse, a singular bubble floating in a sea of infinite bubble universes. If M-theory is proven correct, we may perhaps finally find an answer to the question, "What happened before the big bang? "This is an exciting and unforgettable introduction into the new cutting-edge theories of physics and cosmology from one of the pre-eminent voices in the field.